When You've Seen Subway Rats, Ebola Seems Like Nothin' : Goats and Soda New York has no time for fear-mongering and wild speculation about the spread of disease through their city. They're too busy crafting the perfect "Ebowla" joke for Twitter. The media is all over this story: Ebola in NYC! Don Weiss, a doctor with the New York City Health Department, faces microphones outside the bowling alley visited by the physician who tested positive for the virus. Yesterday, public health officials announced that Ebola had been identified for the first time in both Mali, a country that neighbors Guinea, and New York City. The arrival of the virus in another West African country is a cause for concern. The World Health Organization has sent a team of health experts to manage contact tracing and infection control for the two-year-old patient. 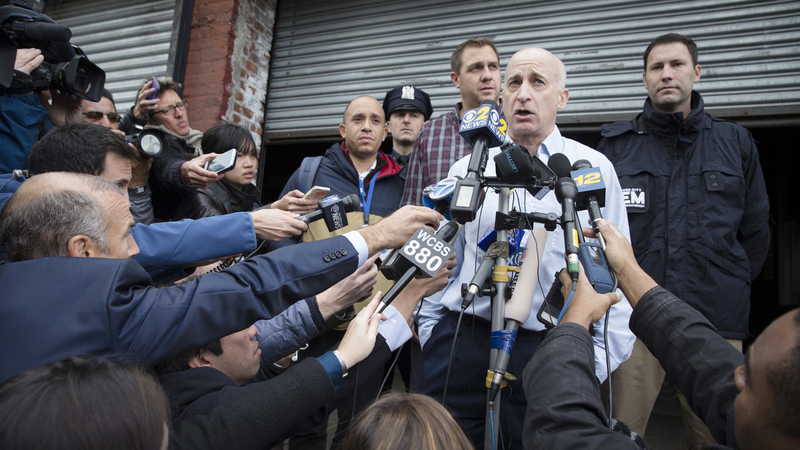 The doctor diagnosed with Ebola in New York City is already in isolation; his fiancee and two friends are in quarantine. It seems highly unlikely that the disease will spread far from this one case, a message that has been reiterated by government officials. But the emphasis is hardly necessary, since it seems many New Yorkers are already over the fear-mongering and panic that we saw when Ebola surfaced in Dallas.